A brand new tool, InVision Studio comes up with a bunch of amazing features which should help designers improve their workflow from the beginning till the end of a design process. However, it’s still in an early stage, so there will be bugs and issues; there is still scope for a lot of improvement in several areas, but for now, it sure is a rock solid design tool. We all know InVision, the famous prototyping tool, making our lives easier by helping us prototype our designs into animated interfaces so our clients get super impressed by our work. 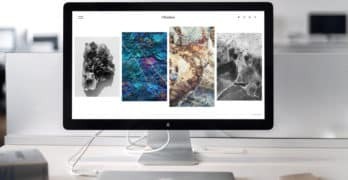 But over the past few months they have been dropping hints on their new screen design tool, probably an Adobe “killer” one, all over the web and I had to check it out. And yes, the hints were all true. Invision launched their new screen design tool called InVision Studio, but it’s still in its early stages. I signed up for an early access to the tool and just received it a couple of days ago began playing around with it. InVision Studio is a new design tool launched by the guys at InVision. This tool allows designers to design, prototype and animate at one place. Viewing the promotional video itself is enough to convince a lot of people to try the tool; the video shows the tool’s sleek UI, innovative features and the easy animations. It’s still at its early stages so obviously there will be bugs and issues but apart from that, it does seem to be doing its said job perfectly. Lightning Fast Screen Design – With an easy to use vector drawing tool and handy functionalities like an infinite canvas and flexible layers, you can design your idea quickly. Rapid Prototyping – The days when you had to design in Photoshop and Sketch and then use a prototyping tool to animate your screens? No need of that with InVision Studio. Create fluid interactions and animations faster than ever and preview your design in the tool itself. Adaptive Layout – Quickly design and adjust your screens to fit any screen or layout automatically. Built-In Animation – Now who wouldn’t love this – Frictionless and easy animations makes it easy to take your designs to next level. Collaborative Approach – Since it’s a product from the stables of InVision, this sure was expected. Easily share your project with your team for inspection and quick feedback. To learn more about this tool, you can check out a whole list of tutorials on their page as well as by many other designers on YouTube. The ability to import your Sketch file easily to the tool. You can save your Sketch file and then open it in the tool and all your layers and styling remain intact. Win! As I mentioned before, the learning curve isn’t much; if you are familiar with Sketch, then you can easily work with Studio. With an almost similar interface, the familiarity remains to make the transition easier. There are a few tutorials available to give you a fair idea of the interface and the basic tools. I tried a couple of interactions and animations between the screens with the help of tutorials. The animations are pretty smooth and clean. That’s pretty rad, being able to animate screens right in the tool itself. Sometimes working with the interactions gets a little confusing, and you may have to manually adjust the timelines for the animations which can be cumbersome. As far as I have heard, there are updates in the works and it should solve that problem. Easily switch between interfaces. Want a dark theme? It’s there. A light theme? It’s also there. See, a win-win situation. I am still trying out this tool, so I’ll be updating as I keep learning more about it. Since InVision Studio is still in its early stages, there are still a lot of issues and bugs that only future updates will rectify. Apart from that the thought of designing, animating and prototyping all in one tool sure is exciting. What’s good about InVision Studio is its ability to improve your workflow and minimise efforts that goes into motion design. Sketch is now almost the industry standard for UX/UI Designers because of it’s easy to use interface and tools, a huge variety of resources at its disposal in the form of icons, UI kits, wireframes etc. and the ability to install plugins for a variety of needs. And with it’s recent update, one can even prototype their screens within Sketch itself rather than using another tool. Sketch obviously wins hands downs because of its age and familiarity to use. Sketch comes at a price ($99/year), whereas InVision Studio will come for free. Maybe that could be the one thing which may make users want to try (or maybe switch to) InVision Studio. Although an amazing tool which sure will improve a designer’s workflow and efforts involved in prototyping and animating, it still needs work to be done. Remember it’s still in early access mode, so there will be bugs which will be resolved in future updates. Since the learning curve is easier, it sure won’t be difficult for designers to make the transition. Do give it a try and let’s wait on for the future updates to see what new advancements come up for InVision Studio. I know I sure will be keeping an eye out for the future updates on the tool. One last thought though; ultimately, it’s not the tool that makes the designer, it’s your skills and understanding about design that will make you a better designer. Remember this. Ah, the mistakes come partly because of the excitement to design their first … Read Full Answer about What mistakes do beginners make when they design their first UI? What are the career goals for a UI Designer? Career goals for a UI designer should be no more or less different than for … Read Full Answer about What are the career goals for a UI Designer? When working with tight deadlines, how can UX designer become more efficient? Tight timelines are something pretty common when working in the Agile model and … Read Full Answer about When working with tight deadlines, how can UX designer become more efficient? There is no way one can improve the UX without changing the interface. UX is not … Read Full Answer about What is the best way to improve user experience (UX) without changing the interface?